​Thank you so much for your interest in arranging a fundraising event for The Sustainability Centre and our Leaves for Learning appeal. We really do appreciate your support. You can download our Fundraising Pack that will give you lots of handy hints and tips - do get in touch with us and let us know what you're doing so we can help and guide you (we know how unnerving it can be to organise an event), and help to spread the word amongst our network. There's lots of different things you can do to raise money - from getting sponsored to do (or stop doing) something, or organising an event - it doesn't have to be on a big scale, perhaps just a bake sale in the office, or at school! 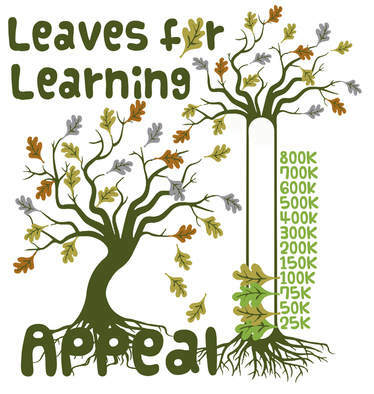 Perhaps you're already signed up to take part in a challenge, like the Great South Run or Ride London and you're looking for an extra bit of motivation; why not ask your colleagues, friends and family to sponsor your efforts in aid of our Leaves for Learning appeal. We have sponsorship forms and can guide you in setting up an online sponsorship page. If you're planing to organise an event, we can provide advice, and we do have some materials you can borrow, such as pop-up banners and t-shirts. ​You can contact Lorraine, our fundraiser, here or call 01730 823 166. You can help us raise money every time you shop online. Give As You Live is an online shopping facility which raises funds for charities. Earthworks Trust Ltd is our charity company name and we are registered with Give As You Live. Shopping through Give As You Live costs you nothing. It's just as secure and is no different to shopping online normally. Almost every major online store is available through them.